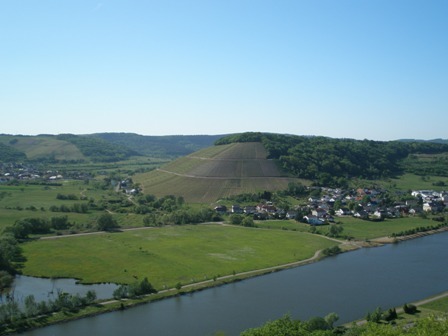 One of the premium Riesling producing wine regions in Germany is the Saar, which is part of the Mosel region (the English usually call it Moselle, using the French word for the river). 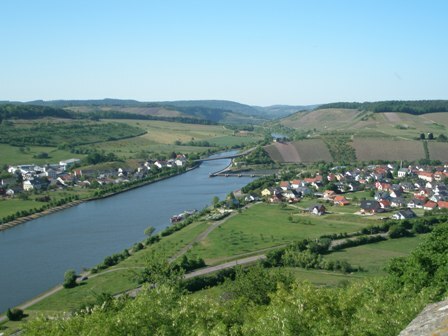 In fact the Mosel Wine Region used to be called (until 2007) “Mosel-Saar-Ruwer”, the latter two being small tributaries to the larger Mosel river. Along the three rivers about 13,400 ha are under vines these days, most of the vineyards are to be found on steep slopes, offering breathtaking views. 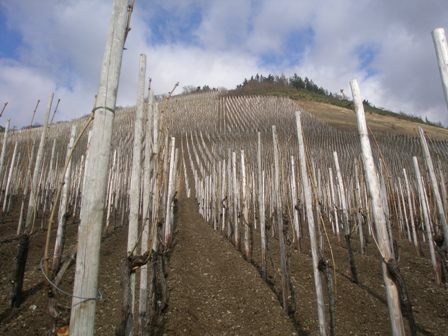 Along the river Saar vine cultivation goes back a long long time, roughly 2,000 years only. Until Napoleon conquered this part of the various German lands, most wineries were in possession of the catholic church, monasteries, and other clerical institutions. Napoleon secularized the administration and with it most vineyards and wineries came into private hands. 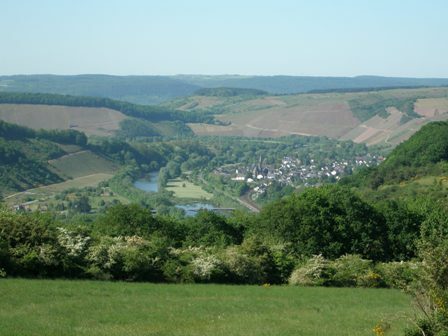 Serrig, Saarburg, Irsch, Ockfen, Ayl, Schoden, Wiltingen, Kanzem, and Wawern. 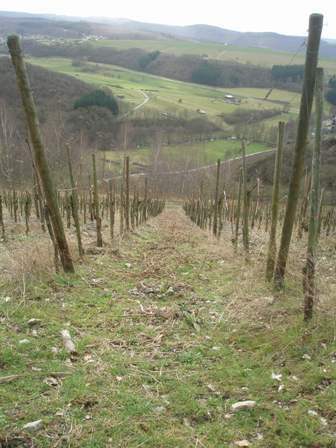 Moreover we find vineyards along one of the smaller side valley’s Filzen, Koehnen, Nieder- and Obermennig, Krettnach and Oberemmel. The dominant variety is, of course, Riesling. 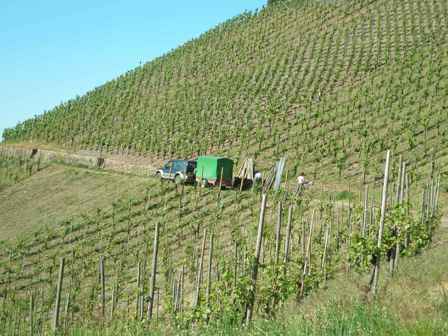 The total area under vines is about 1,500 ha, mostly on steep slopes with gradients of up to 55 per cent. Other but minor varieties are Pinot Noir, Dornfelder, Pinot Gris, Rivaner, Kerner and Pinot Blanc. The soil consist mainly of blue Devon slate soils. The alcohol content of the wines is usually low (between 8 and 12 %), but the acidity of the wines shows excellent structures and compositions and this is why the wines can be cellared for long periods of time. 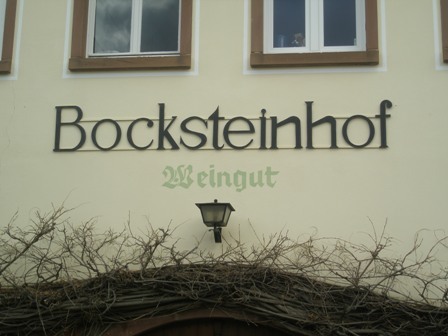 The two photos above were taken in Ockfen, showing vineyards in the location ‘Ockfener Bockstein’, one of the prime ‘terroirs’ in that village. Springtime and lots of work to do to make the season a success. 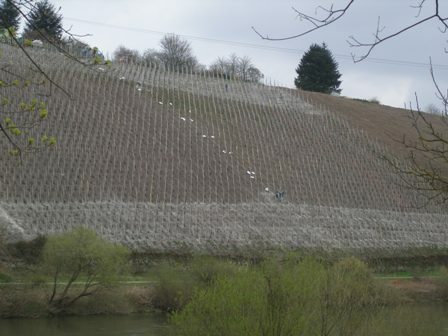 Lime is distributed by hand in the vineyards, here in Schoden. 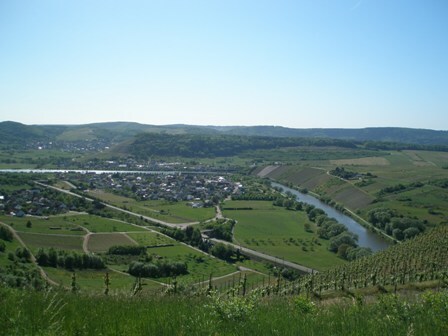 There are many prime wine producers along the Saar. The top estate is probably Weingut Egon Mueller (also called the godfather of Saar Riesling) – Scharzhof in Wiltingen. Among the highest rated Riesling wines in Germany (on www.riesling.de) Egon Mueller has three of the top eight wines. But there are many other prime producers. I can only mention a few. For instance Weingut Fortsmeister Geltz-Zilliken in Saarburg, or Schloss Saarstein in Serrig. Then there is the rising star, Roman Niewodniczanski and his team at Van Volxem in Wiltingen. His wine maker, Dominik Voelk, is young and ambitious, and by the way is a native of Franconia, a wine region with long traditions in excellence. When I visited the estate in March, he had completely sold out all his wines. I am now waiting for the release of the newest vintage in September (grand cru only). Then there is Weingut Dr. Siemens in Serrig and Weingut Peter Lauer in Ayl. Also other producers are worth mentioning. Weingut Reichsgraf von Kesselstatt, which operates a wine bar just across the cathedral in Trier (Trierer Dom), possess vineyards in Wiltingen. Four star ratings were awarded to Weingut von Orthegraven in Kanzem and Weingut von Hoevel in Konz-Oberemmel but there are many others who produce excellent Saar wines. I love the Saar Rieslings with their well balanced, “filigree like” acid compositions. I love them for their explosiveness, zest, intensive aromas; they have structure and balance, are low in alcohol and usually impress with a long finish, lingering on your tongue’s taste buds like ballerinas which you can still see before your inner eye long after they left the stage. I encourage you to visit the Saar and sample as many wines as you can, it’s worth it, definitely. This time of the year should be perfect, as the pictures below demonstrate. I hope they can entice you to give it a go and lure you to the Saar. Explore the beauty of my home region, do not forget to visit Trier, its just around the corner. Near Schoden the Saar is most picturesque. The hills, the forests, the river and the small villages offering local food and wines make the Saar a prime destination for tourism. This entry was posted on Saturday, June 28th, 2008 at 7:45 am and is filed under wine regions. You can follow any responses to this entry through the RSS 2.0 feed. You can leave a response, or trackback from your own site. Halloo an alle dda draussen! Der Wein im Saarland ist doch ungeniessbar – wie kann man nur einen solchen Mist verzapfen. Wo kaufe ich den Moselwein aus Saarburg in den USA?